How do I order editing and proofreading services? Please visit our editing and proofreading page to initiate an order or learn more about this solution, including pricing. What types of editing or proofreading do you offer? Our standard editors put their inner perfectionists to good use, proofreading your writing until it is 100% error-free. In addition to performing standard proofreading, our expert editors will also copy edit the text, tweaking and refining the language to improve its clarity, style, power, accuracy and impact. The result: A well-crafted document, enhanced for maximum impact. Our premium editors can do deeper edits, making structural adjustments to enhance clarity, logic, and flow. Where necessary, they rewrite sentences and paragraphs for maximum impact. Our “Premium” editing option does involve a minimal amount of rewriting in cases where it improves the flow. Content that needs to be entirely rewritten is best served by one of our traditional writing solutions. Begin by identifying the content type that best fits your document and be sure to upload that “source” document in your content brief. How much do editing and proofreading cost? Pricing is simple and transparent, with no surprises or hourly rates. Pricing is per word as stated on our Editing & Proofreading page. Specific pricing is provided by an instant, automatic quote. To find out the cost of your project, open the order form and provide your text, either by uploading the original document or by pasting the text in the text box. I'm concerned about confidentiality. The documents I'm sharing are proprietary and private. Guaranteed client confidentiality is a core commitment of our service. As stated in our Terms and Conditions, all work remains entirely confidential, including project instructions and any assets you provide. Prose writers, editors, and account managers must also agree to a separate set of terms that includes a strict confidentiality clause. Our editors are carefully vetted professionals with years, even decades, of editing and proofreading experience. Prose is based in Manhattan, the publishing capital of the world, so many of the editors in our network currently serve (or formerly served) as editors in the publishing industry — at large book publishers, indie presses, magazines, and newspapers. Can you edit the text in a specific style (e.g., AP)? Yes. In the content brief, you are welcome to specify a preferred editing style, if you wish (e.g., AP, Chicago, MLA, APA). We use our own style guide. Can you conform to this guide? Yes. Please upload your style guide in the “Brand Guidelines” section of the content brief. This information will remain in our system for future projects as well. I need an editor with subject-matter expertise. Is this possible? Yes. Specify your requirements on the content brief by selecting the relevant industry or sub-industry. Please note the additional 20% surcharge for specialized expertise. English is not my native language. Can you help? Yes. Please make note of this on the content brief. For non-native speakers, all work is billed at the “Premium” service rate, due to the level of work required. How will the edits be delivered? How can I see what changes have been made? The edited version will be delivered just like other content from Prose — in our platform text editor, with an option to download as a .doc file. All changes are tracked for quick and easy viewing. When you receive your Prose-edited content, our tracked changes (additions or deletions) will be visible in the document. This cloud-based platform also gives you the option to insert your own comments via tracked changes. Each user’s changes are time coded and colored differently for quick and easy assessment. How do I accept or reject a (single) change? When you receive your edits, you may agree with some changes and disagree with others. Two buttons make it easy to accept or reject individual changes. Click on a change, then click to Accept the Change. Click on a change, then click to Reject the Change. How do I accept or reject all changes? Click to Accept All Changes in the document. 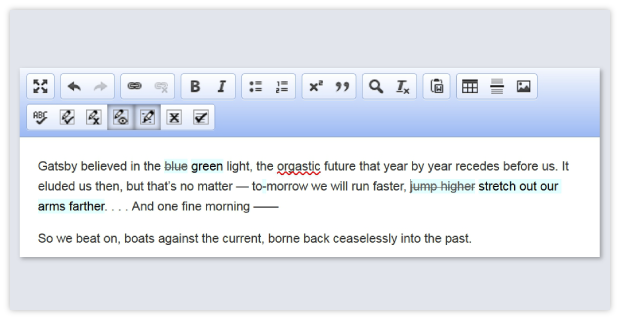 If you are pleased with our Prose edits, this handy feature will save you the time of accepting changes one by one. Click to Reject All Changes in the document. How do I hide tracked changes? Click to hide all tracked changes in the doc. You will see a “clean” document without any tracked changes. This feature does not remove the changes, but hides them. Want the changes to reappear? Just click the same button again, and the tracked changes show up again. How do I turn off Track Changes? Note: This feature only works when every change has been accepted or rejected. Can I see who made a tracked change, and when? Yes. 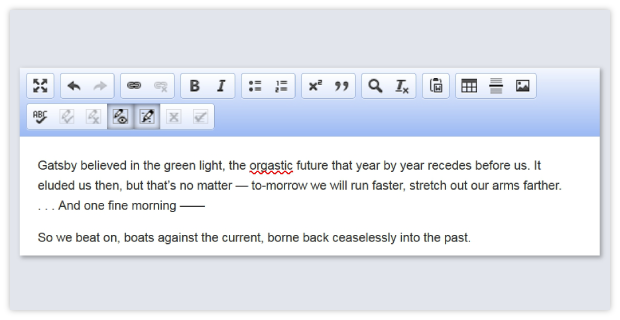 Hover over a tracked change to see who made the change (e.g., Prose, the editor, or you), and when the change was made. I want to review tracked changes in Microsoft Word. How do I do this? Simply download your content as a doc and open it in MS Word. All tracked changes will be visible, allowing you to use MS Word’s own “Track Changes” feature. Can I download in Microsoft Word, make additional changes, then have Prose review? No. Once the document has been exported from our platform to MS Word, it cannot be “re-imported.” Until your document has reached the approval stage, continue to view and make relevant comments on our cloud-based platform. Prose uses this platform for its ability to offer seamless collaboration and a streamlined workflow. After Prose edited my document, I made some additions. Can you edit the new version? Unfortunately, no. If you’re not pleased with the edits we’ve performed, you can request up to two rounds of complimentary revision (i.e., further edits). Just let us know how we failed to come through with the type of edits you requested, and we’ll address your concerns right away. However, if you alter the original document by changing the structure or adding new material such as sentences or paragraphs, you will need to place a new order in order to have the new version edited by Prose. I have a large editing project (e.g., a book-length manuscript). Can you help? Yes. You are welcome to upload the entire document in a single content brief, or upload portions (e.g., individual chapters) in separate content briefs. Can you edit different variations of English? Yes. In addition to American English, we can also edit UK, Canadian, and Australian English. Be sure to specify your desired type in your content brief. What if I'm not pleased with the editing? In the rare event that the edited document doesn’t meet your needs, you can request up to two rounds of complimentary revision. Just insert your comments in the general feedback box or as comments on specific paragraphs, then request a round of revisions (i.e., another round of edits). "I requested British spellings on the content brief, but the editor used American." "I requested that the style be made more conversational, but this paragraph still sounds very stilted and formal." No. We assume that the document includes the appropriate citations and that you have cleared your work through a plagiarism checker. For this particular content solution, Prose only edits and proofreads. In addition to editing, do you perform research and fact-checking? No. We edit and/or proofread your text as provided. We do not perform additional research or fact-checking — nor do we check citations or references. I'm a student. Can you edit my term paper or admissions essay? Yes, with exception. Of the three editing levels Prose offers (Standard, Expert, and Premium), only the first two options are available for schoolwork. Both Standard and Expert are limited to light copy-editing and/or proofreading. For ethical reasons, we are unable to perform structural edits or rewriting of any kind. If Prose receives an order for “Premium” editing and we believe (rightly or wrongly) that it will be used in an academic setting, we cancel the project and no charges apply.